Home Brands Artdeco Which eyepencil is the best (and the most black)? Urban Decay – Zero is a very nice black pencil. The tip isn’t very thin. It’s soft but not too soft. It’s long lasting. I like it a lot. Bourjois – Noir Expert is my latest acquisition. It was a gift in a set that I bought. I didn’t expect much of it and to my surprise it’s a fantastic eyepencil. The tip is thin and quite precise. It’s not very soft, but it’s not hard either. It’s very pigmented. Just one swipe and you get a crisp black line. It’s not smudge proof, but it stays very long on my waterline. So far my favourite black pencil. I’ve been using it almost everyday since I got it. 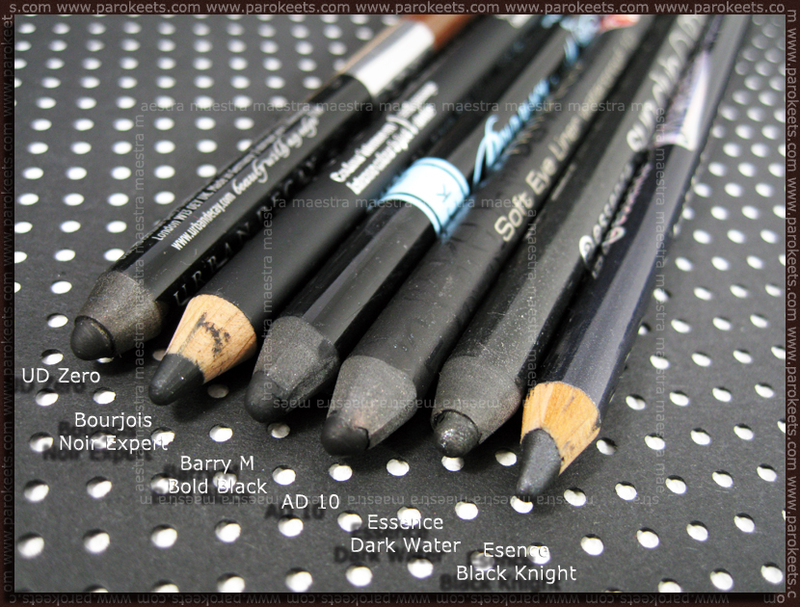 Barry M – Bold Black is another very good black pencil. It’s truly black. But my problem with this pencil is that it’s too soft. When I’m lining my eyes with it, it melts like crazy and it gets stuck between the lashes. It’s long lasting. It stays on the waterline quite long as well. 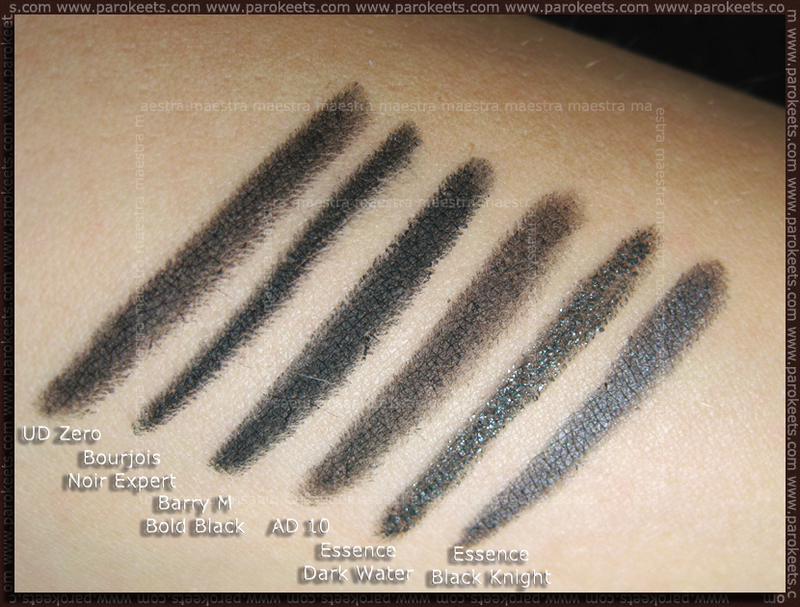 Artdeco – Soft Kajal 10 is the least black from the bunch. It’s similar to UD Zero if you ask me. A very good eye pencil and it was one of my favourite black for a long time, but now the Bourjois has taken it’s place at the top. Essence – Sun Club Dark Water and Essence – Metallic Black Knight are my least favourites from the bunch. The Dark Water one is a bit too soft and it has silver shimer. Black Knight is not long lasting on me. To sum it up: My favourite is the Bourjois one. It’s easy to use. One swipe is enough for a crisp black line. It works very well on the waterline. It doesn’t “upset” my eyes. My least favourite or the least used are the Essence ones. I don’t know. They are just not my cup of tea. One is too soft and has too much silver shimmer and the other one isn’t long lasting enough for my liking. And finally the Bourjois eyepencil “in action”. So, these were my black pencils. What are your favourites? Meni je Artdeco med boljšimi, ker je edini, ki mi ne solzi oči. Super post, še več takih :) Od predstavljenih imam samo Essence Sun Club Dark Water, ki mi je sicer zelo všeč zaradi obstojnosti in bleščic, ampak ga moje oči žal ne prenesejo na “waterlineu” – začnejo se solziti. Pojma nimam zakaj, kaj takega se mi ni zgodilo z nobenim drugim eyelinerjem. Drugače je pa tudi meni zel všeč Essence Black Mania eyeliner, ampak tega ne izdelujejo več. Sem pa ravno razmišljala o nakupu Artdecovega eyelinerja in zdaj (hvala tebi ;)) vem, da ga nočem – potrebujem bolj konkretno črno črto. Se bom(o) potrudile, da objavimo več takšnih postov. Verjetno s takšnimi posti misliš na primerjave? Tudi mene Sun Club-ov malo draži na WL, Bourjois pa niti pikico. Imam pa jaz glede tega dokaj občutljive oči in me kar veliko svinčnikov draži na WL in mi povzroči rdeče oči. I really like Bourjois pencils. Yesterday at the drugstore I tried Effet Smoky Pencil in 76 Ultra Black – it’s a very very deep black. I bought Sparkling Mochca though, because I was looking for a good brown eyeliner pencil (BTW it’s awesome :drool: ). I also bought the brown (and the purple) Bourjois Effet Smoky pencil just two days ago. :yes: They are both nice. The purple one isn’t as soft as the brown one but still nice. Zero so very nice. Have you tried any of the Bourjois pencils yet? Tega od Catrice pa še nisem preizkusila. Morda ga pa kdaj iz firbca nabavim (ko se bodo gospodje in Gospe odločili, da v LJ v Mullerjih postavijo Catrice stojala :sigh: ). Jaz črnega svinčnika ne uporabljam, mami ki uporablja samo črnega pa prisega na Bourjois. That’s true. ;) The Sun Club eyepencil by Essence is nice and it’s definitely worth the money, bur I still don’t love it. It’s just an OK pencil for me.